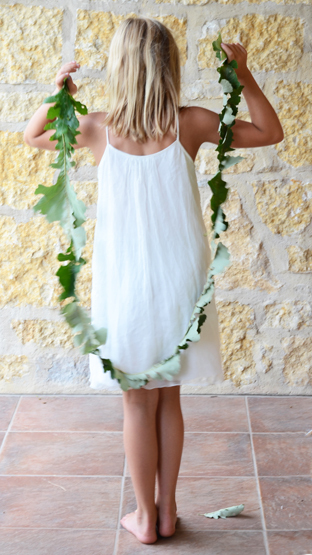 Keep the wonder in everyday: Make Leaf Jump Robes! OR make Leaf Garland! We used both for a recent party! Jump below with us to learn how, too! This Summer, we made these Leaf Garlands and Leaf Jump Ropes for Gray’s Camp Grayson birthday (click here). In tones of red, orange and gold: wouldn’t these be tailor-made for a Harvest party? I would love to have one this year. TUTORIAL IMAGES:left: see the stitches right: note how the leaves are layered and stitched.